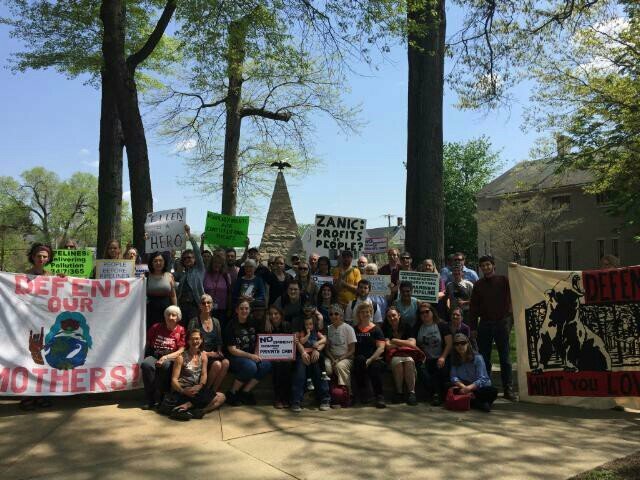 Huntingdon, PA: This morning, dozens of residents from across Pennsylvania converged at the Huntingdon County Courthouse for a press conference and rally in support of Ellen Gerhart. This afternoon, Gerhart was scheduled for a court hearing, after attorneys for Texas-based Sunoco claimed Gerhart violated a court-ordered injunction while monitoring construction of the Mariner East 2 Pipeline on her land. If convicted, Gerhart could be sent to jail for up to six months without trial and be forced to pay restitution to the company. Just before the scheduled hearing, County Judge George Zanic agreed to continue the case until July 6, placing Gerhart on a $25,000 unsecured bond. This legal bullying adds insult to injury for the Gerhart family, who already have had their land seized and destroyed via eminent domain to enable Sunoco to build the Mariner East 2 natural gas liquids pipeline through their property. The Gerharts have never given Sunoco permission to enter their property, and have been opposing the Mariner East project for over three years. At 11am this morning, the Gerharts hosted a press conference in front of the Huntingdon County Courthouse. Sunoco, a fully owned subsidiary of the controversial pipeline company Energy Transfer Partners, has wreaked environmental havoc across Pennsylvania while constructing the Mariner East 2 pipeline. Since construction began, there have been an astounding 106 documented spills, with more occurring each week. At the press conference, Pennsylvania residents impacted by these spills spoke out in support of the Gerharts’ attempts to protect their water, including US Navy Veteran Ralph Blume and US Marine Veteran David Anspach. Currently, the Gerharts are involved in numerous lawsuits over the project, including contesting the use of eminent domain for Mariner East 2, a pipeline with the primary purpose of shipping ethane, propane, and butane to Marcus Hook to be exported to plastics manufacturer Ineos in Norway. 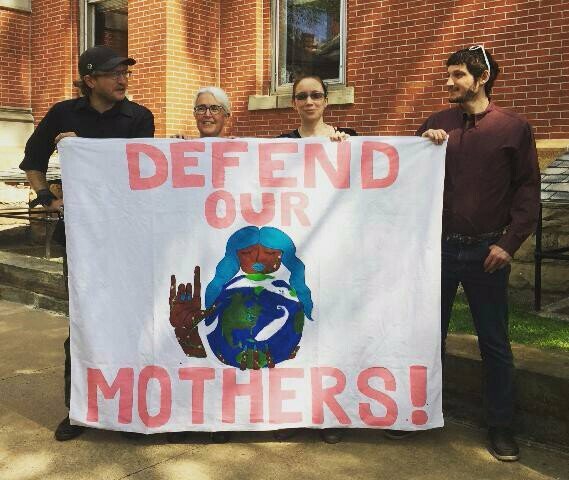 Additionally, the Gerharts have levied a federal civil rights lawsuit against Energy Transfer Partners, private security contractor TigerSwan, the Pennsylvania State Police, the Huntingdon County Sheriff Department, and a creator of a faux-grassroots facebook page called PA Progress over continuous harassment the family has faced since deciding to oppose the pipeline project. Keep on fighting for what is right and just. There are still people like me that believe Justice will prevail. Well stated, thank you for the continuing struggle to defend the planet, the people & water for the next 7 generations of our children!